The Ron Desmett Memorial Award for Imagination with Glass is for artists who think outside the box, practice curiosity, and take risks to create unique, imaginative works that are either entirely glass or that incorporate glass. Ron Desmett was an artist who eschewed conventions, promoted idea over technique, and ultimately posed the question: "Is this work truly ‘me’?" Through experimentation and innovation, he developed his own autobiography in glass. A student of high school age who shows rare talent and whose work embodies Ron’s spirit. An awardee in this category will receive, upon high school graduation, a $2,500 cash award to be used for further education and a year of free classes and private instruction at PGC. An artist whose main discipline is glass, whose work embodies Ron’s spirit in a creative nature, and who shows great promise. An awardee in this category will receive a $2,500 cash award and time in PGC’s studios to create a new body of work. An artist whose principal medium is not glass, but who, over their creative lifetime, has embodied the experiential and experimental qualities that Ron valued. An awardee in this category will receive a $2,500 cash award and time in the PGC studios with the help of an experienced glass artist to create his or her vision in glass. 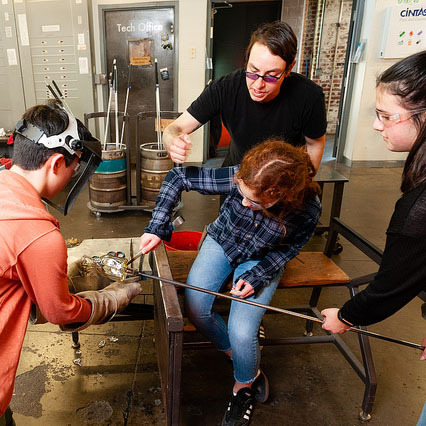 A writer whose area of interest is craft and who seeks to explore new critical approaches to writing about glass and glass art as the field continues to develop. Writers must have previously published, field-specific articles or manuscripts and be willing to work on questions posed by the award committee, so that new critical ground can be broken. An awardee in this category will receive $2,500 cash award and a residency in Pittsburgh, during which the awardee will be expected to visit PGC, spend time exploring the medium, and ultimately write about it using their previously demonstrated critical skills and scholarship. Additionally, the awardee would write an essay for publication about an exhibition at PGC and present a lecture at PGC on their chosen topic. Percy Echols II was selected as the first recipient of the Ron Desmett Memorial Award for Imagination with Glass. The award recognizes artists who think outside of the box, practice curiosity, and take risks to create unique, imaginative works in glass or incorporating glass, characteristics that PGC’s late co-founder Ron Desmett valued. Echols receives a $2,500 cash award and time in PGC’s studios to create a new body of work between August 2018 and September 2019. Echols is the only recipient of the award this year. Fifty-one applications were received from around the world. gases and specialized equipment used in neon. With this award, he will continue to build his skill set for plasma neon. “Something that I feel I really need for my own work is the time to build and develop a foundation for this medium sculpturally. It would be a good time to push the scale of my work and to explore ideas in a realm that has never been seen in Pittsburgh,” he said. “Plasma brings something unique to glass, and that is to invite touch, something very difficult. By producing light through the use of electrified gases it removes the barrier between the viewer and art with its animated glow, allowing an invitation for play as it responds to the viewer's proximity and touch,” he said. 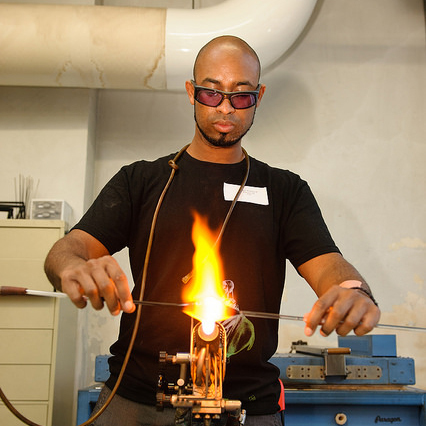 Echols’ interest in plasma began in 2014 at Pilchuck Glass School in Stanwood, WA. 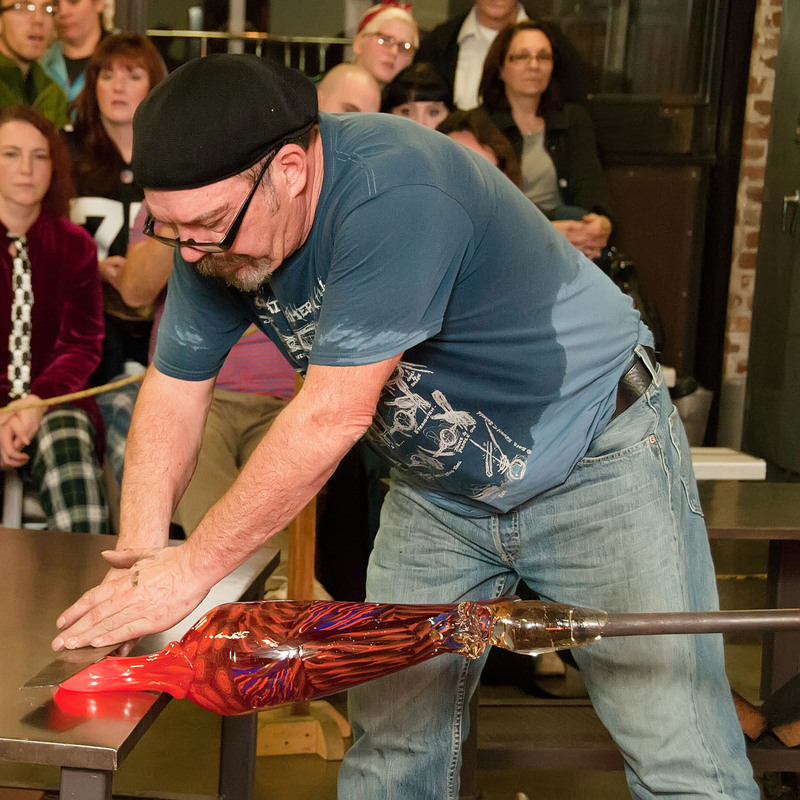 He was introduced to the medium through furnace glassblowing in a class taught by Patrick Collentine. He continued working in plasma while pursuing his BFA at Illinois State University while also working with a local neon and sign making shop in Bloomington, IL. After graduation in 2016, Echols worked at Pittsburgh Glass Center as a studio technician apprentice. During that time he designed and built his first mobile neon lab, a compact and mobile system for vacuuming and filling vessels for plasma or neon tubing. He performed his first public demonstrations, conducted workshops and continued to experiment with the medium. 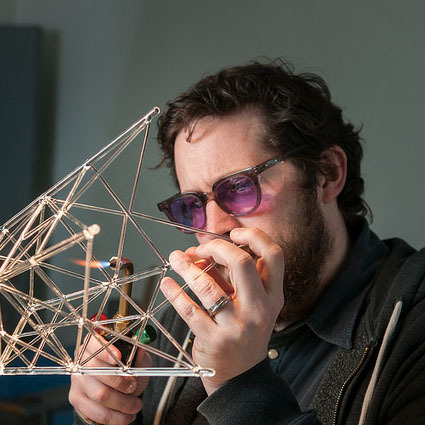 In addition, he has been using the lab to collaborate with artists such as Robert Mickelsen and Chris Ahalt to create new work. Echols launched a blog and podcast called “Taming Lightning” in May 2017 to connect with a larger plasma and neon community, build a network, conduct research and share ideas among artists and makers that use the medium. Most recently, Echols was invited to participate in a neon, plasma, and light exhibition on Murano called “Vetro Illuminato” during the Glass Art Society (GAS) Conference in May in Murano, Italy. This exhibition at Berengo Studio is on view until November 2018.